The restoration of the sovereign state of Biafra is a task that must be accomplished (Mazi Nnamdi Kanu). 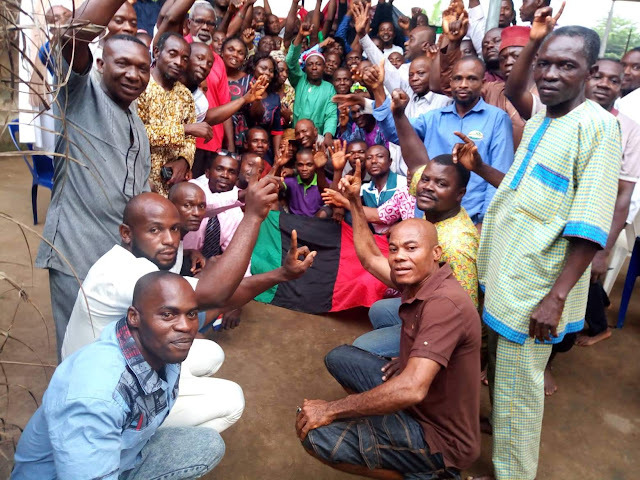 It was indeed a wonderful moment with the IPOB brethren in Igwuruta general meetings, on this day the 11/11/2018. 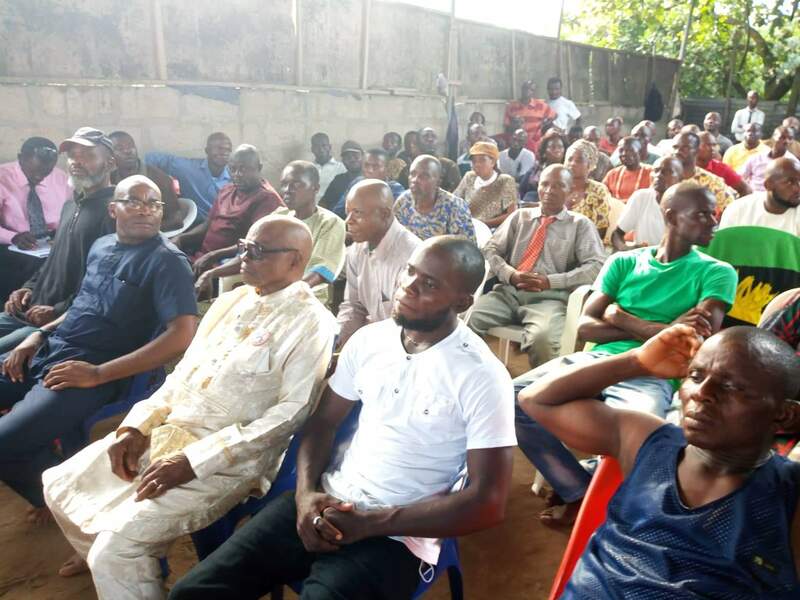 The Igwuruta IPOB held their general meeting/ celebration of the resurfacing of our supreme leader in Israel as his thunderous voice has kept Nigerian state shaking, the cabals are cold and silent over the reappearance of Onyendu Mazi Nnamdi Kanu. The impostor in the Aso Villa is terribly confused on what is to come. People are beginning to ask questions and trying to talk, APC governor threatening to speak, former governor also threatening to talk, pastors and other clergy men speaking up that indeed this is not Buhari with all this developments the good people of IPOB in Igwuruta zone Igweocha decided to come out to thank the supreme leader of IPOB and show the world that the only leader Biafrans know is Mazi Nnamdi Kanu, and not people parading themselves as Igbo leaders to the detriment of the life's of Biafrans. The program started at about 2pm, opening prayer was observed first because we are people that believe in Chukwuokike Abiama and so anything we are doing in this planet we commit it in the hands of the supreme creator of the universe. However, the opening prayer by the coordinator Mazi Linus Mbam, the representative of Ikwerre local government in the senatorial Mazi Eri thanked all IPOB family members present and told them that days are gone when IPOB members hide, that our leader has taken this noble cause to international levels. There were countries that never knew of the genocide of 1967-1970 they never knew that we fought a war because Britain used the media against us but now we are all over the world and such countries has begun to ask questions he said, speaking further he said it only takes a bold man like our leader to speak out against tyranny and fraud, without our leader nobody will know that such fraud really took place in this contraption called Nigeria, they all knew this man was Jubril but no one could speak out he said. 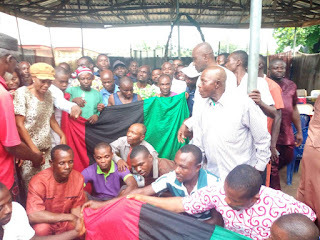 A short Interview was conducted by Rivers State Media (RSM); to a prominent chief (name withheld) a old Biafran soldier (veteran) and an indigene of Igwuruta when asked if his people are in support of this struggle he said that Igwuruta is Biafra, he fought the Biafran war gallantly and Ikwerre people fought gallantly on the Biafran side, he quoted Ojukwu to have said "all die na die" he noted that even the state coordinator here in Igweocha is an Ikwerre man so anybody saying Ikwerre is not Biafra should explain why they answer names like Chibuike Amaechi, Ezebunwo, Chukwuemeka etc, he ended by saying an adage that if his twin brother whose name is Chibuike was kidnapped by Hausa Fulani and taken to the north for years and suddenly one day he saw his twin brother in Sokoto and called him Chibuike and his brother stopped came and greeted him in the cause of their conversion said that he was Chibuike before but he is now Mohammed, of what need is it for him to begin to explain for him that he is Chibuike so forget the lies they are peddling against us. Another family member from Andoni was interviewed, with the name; Mazi Ntesat Yisrael formally known as Israel Brownson but he replaced the Brownson with Ntesat so that his name will sound indigenous and once you hear the name you can easily trace him to where he is from, quoting Chinua Achebe's there was a country he said "a man was travelling in summer he saw that everywhere was white people he asked an old man sir what happened to the black people of summer for history has it that the people of summer where black, ah! The old man exclaimed they forgot their history and so they died" those who do not know their historical enemies are bound for extension he added, speaking further he said if I go to the north they call me Nyamiri and if I go to the west they call me Omoigbo, the only unity you get in Nigeria is the unity of Jonah in the belly of the fish which tyranny and we IPOB are a people that believe in freedom for all, even the animals in the zoo enjoy a lot of freedom than the people in this contraption, when asked if he believe in arm struggle or peaceful actualization he replied peaceful actualization but at the same time to get ready to defend ourselves should the need the arise, and that we must boycott everything boycottable to ensure that Biafra is restored. The coordinator said if it were a church sermon the pastor will say that today is praise and worship, as he started singing Biafra songs which attracted the neighbourhood to join the program, people started trooping in to join us as the children of light sing songs like Holy holy holy.. Nnamdi Kanu is another saviour, everybody was happy and excited indeed the spirit of Biafra is unstoppable like the coordinator will rightly say that the voice of Our supreme leader Mazi Nnamdi Kanu soothes his sorrows, heals his wounds and drive away his fears.